If there is one thing I love to do during the summer, is juice! I take advantage of the fruit available and make orange juice, grapefruit juice, lemonade, strawberry lemonade, I love to make them all! But if there is one thing my boyfriend and I love to drink during the summer, it is Arnold Palmers! If you were to buy them in the store, you would find so much added sugar or fake sugar! This way, I make everything homemade, and it tastes even better. Plus it is less expensive than to stock up on many cans of it pre-made. Below are my instructions of how to make the best Arnold Palmers. 2 packets of cold brew ice tea. 1. Take a large pitcher, fill it with water and put in 2 packets of ice tea. 2. Let the tea brew for at least 5 minutes in the refrigerator. 3. Take the 5-6 lemons, cut them in half and juice them to fill about a cups worth of lemon juice. 4. 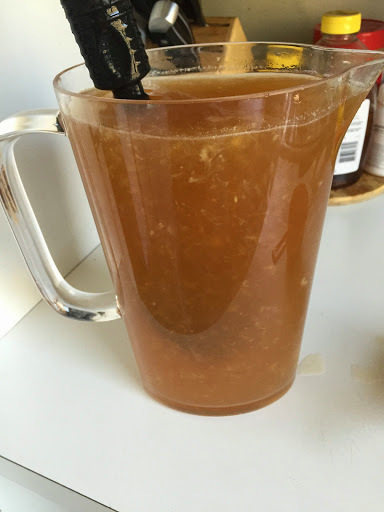 Once you are done juicing, add the lemon juice to the ice tea brew and stir. 5. Add 1 cup of granulated sugar (you can add more or less depending on your sweetness preference) and stir. 6. Pour yourself a cup, add ice and enjoy!